Comic Reviews: Brothers Dracul and Crude! This week it’s an indie spectacular with Aftershock Comics’ Brothers Dracul and the new Image series Crude! I’m naturally interested in anything that has to do with the legend of Dracula, so Aftershock Comics’ new series Brothers Dracul piqued my interest. 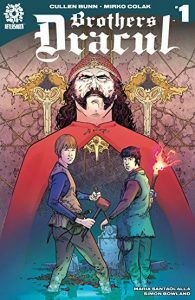 While many comics about the infamous Son of the Dragon focus on his vampiric mythology, the Cullen Bunn and Mirko Colak series instead focuses on the actual historical figure Vlad Dracul, and his life as a young boy with his brother and father. Radu Dracul returns home to visit his brother and finds a horrifying sight: hundreds upon hundreds of people impaled on large pikes. Shocked by what his brother has become, Radu thinks back to their childhood together and remembers a time when the two brothers were in battle against an enemy Sultan, but were captured with their father. After making a deal for their lives, their father is allowed to leave, but the two sons must stay behind with the enemy. Cullen Bunn is no stranger to comics with a darker edge, but I wish he was able to keep this story more engaging than it is. Brothers Dracul starts off really strong, and I almost thought that the series would focus on Radu’s attempts to help his brother return from the brink of madness. But once the flashbacks begin, the issue’s plot starts to slow down a little. That may be because we don’t know how this story from their past connects with the main story, but as it stands right now, it definitely slows the book’s pace considerably. On the art side of things, Mirko Colak brings a solid and really grisly style to Bunn’s script. The opening splash page depicting Vlad’s “work” is suitably gory and disgusting, and Colak does a great job of showcasing the horror on Radu’s face, and the despair Vlad’s subjects feel. The battle sequence is also drawn well, with Colak showing a natural flair for frenetic action sequences. While Brothers Dracul loses steam as the book continues, I’m still going to check out the next issue to see how the flashbacks relate to the main story. At the very least, it’s cool to see a Dracula book focus more on the actual historical figure than the legend, even if I did miss seeing Vlad turn into a bunch of bats. I honestly didn’t know what to expect from Crude when I first started reading it. Based on the title I assumed the Steve Orlando and Garry Brown Image series was going to involve something with oil, but I wasn’t expecting a family drama about a Russian man who’s son is mysteriously killed after going to work on an oil refinery. Going in completely cold was the best way to check out this series, and the mystery is pretty solid and engaging. Years ago, Piotr’s son Kiril left to work on the Blackstone oil refinery. Fed up with being persecuted in his home country, Kiril left behind his family and friends to make money on the refinery, only to end up dead. When Piotr picks up his son’s body, he decides to travel out to Blackstone to try to piece together Kiril’s life on the refinery and what could have led to his death. Steve Orlando’s script takes some time to get that mystery going, but that’s honestly not a deal breaker here. 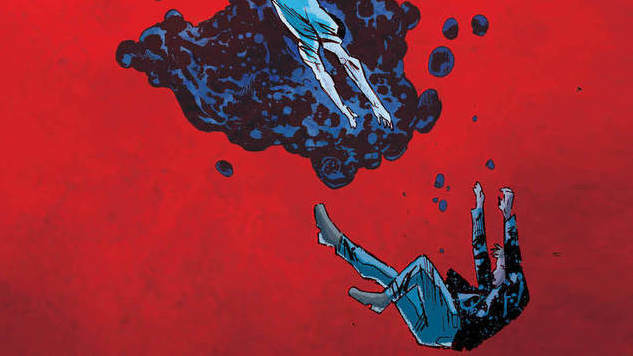 Much of the issue is spent giving us the background information on Piotr and Kiril so that we completely understand not only Kiril’s motivations, but the sadness Piotr feels when Kiril’s dead body is brought back to him. We’re just as engaged as Piotr is in his son’s death, and want to find out what happened to him. Garry Brown’s art is perfectly suited for this kind of comic. Since his style is more in line with a dramatic comic like this, it makes sense for him to deliver some of his best work with this issue. While his rough style is still apparent in some panels, it actually adds to the mood of the issue, as his close ups and use of shadow help to present the mysteries of Kiril and Piotr’s lives. 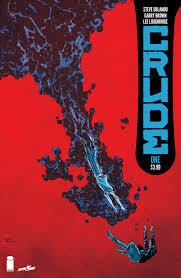 Crude is a series that probably won’t make a ton of waves on the comic stands, but it really should. A family drama/mystery comic is not something you see on the shelves every day, and it’s actually a really engaging and refreshing read. If you’re looking for something different to try out in your comic reading diet, this is the book to check out. VGMpire Rocktober '13 halfway complete! Should You Use Marvel Unlimited? Hover: Revolt of Gamers – Watch Us Play Jet Set Radio’s Spiritual Successor!